We’d love your help. Let us know what’s wrong with this preview of Chasing Cinders by Elizabeth D. Marie. Through tragic circumstances, a prince becomes King at a young age. While a war-torn kingdom begins to heal, a new battle begins—a battle for the King’s heart. Having lost her father in the Great War, her only home reduced to ashes, Ella discovers there is more to the King’s heart than meets the eye. And love can hold many secrets. Haunted by the pain of his own losses, familiar with deception, and reluctant to love—yet Alaric is drawn to give his heart to the girl he can never have. Because the truth may destroy their tender bond forever. Will the expectations of the kingdom overrule his heart? To ask other readers questions about Chasing Cinders, please sign up. Chasing Cinders is a wonderful and creative retelling of the classic fairytale. The setting and characters are beautifully written. The way the author wove in the spiritual elements was interesting, too. I look forward to reading more work from Ms. Marie. If you enjoy sweet romance with a good dose of action and a dash of mystery, you might enjoy this book. I thought it was a great fantasy tale and I really didn't want to put the book down once I got into the story. (After reading this again, I w Chasing Cinders is a wonderful and creative retelling of the classic fairytale. The setting and characters are beautifully written. The way the author wove in the spiritual elements was interesting, too. I look forward to reading more work from Ms. Marie. If you enjoy sweet romance with a good dose of action and a dash of mystery, you might enjoy this book. I thought it was a great fantasy tale and I really didn't want to put the book down once I got into the story. This book was my introduction to Elizabeth D Marie's fabulously written Crown of Stars series, and to her work in general. I love fairytales and the way this author weaves her stories is so beautiful. I like happy endings and she worked that in as well. I'm a realist and there are definitely moments of sorrow woven into this tale. I really never knew what was coming next and could hardly put the book down once I started reading. My favorite character is this book was a side character -- the Captain of the Guard, Tarrent. I liked him best because I admire the personality traits that make him who is he. He's a man of integrity, loyal, determined, and takes his job seriously. My second favorite character is Halena, the healer. She's everything a loving grandmother should be, even though she isn't related to any of the characters she treats. The second installment in the Crown of Stars series introduces a post-war world where young king Alaric is struggling to bring his war-torn kingdom together in unity and uphold promises that could risk his claim to kingship. While there is a time jump between this story and the end of Saving Beauty, it’s easy to pick up on who’s who when returning to this storyworld. While characters from the previous book do make appearances, the primary focus is on Ella and Alaric. 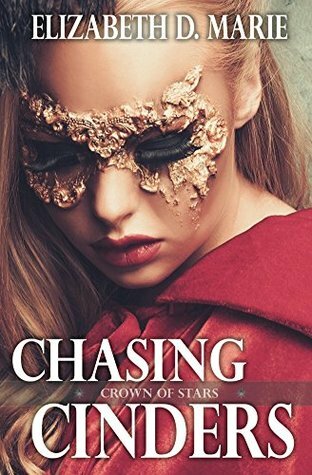 Ella clings to her faith in a The second installment in the Crown of Stars series introduces a post-war world where young king Alaric is struggling to bring his war-torn kingdom together in unity and uphold promises that could risk his claim to kingship. Ella clings to her faith in a time of loss and uncertainty, even when faced with disdain from others and being surrounded by a world of secrets. Ella’s strength comes from her ability to forgive the wrongs of the world while still choosing to stand for what she knows is right and true. Since the events of Saving Beauty, Alaric’s time as king has not always been kind. Like Ella, he draws strength from his faith but also struggles with questions about his worth as ruler of his kingdom amidst mysterious threats coming from outside the kingdom—and those lurking within. I enjoyed learning more about Asteriae and its culture, especially with the kingdom still trying to find its footing again after such a long war and the years following it. The plot regarding the attempt on Alaric’s life keeps the story moving forward, and when all was revealed, I honestly didn’t see some of those twists coming. Hello everyone! So excited to share my new book with you, the next installment of the Crown of Stars series! Also, be sure to check out Saving Beauty, book one. These are individual stories, however, and can be read as such. Elizabeth D. Marie enjoys writing stories that integrate faith, history, adventure, romance, and the real-life struggles of the human condition. Her favorite room is her library, where she continues to run out of bookshelf space—filling them with favorites like CS Lewis's "The Chronicles of Narnia", Elizabeth Gaskell's "North & South", Jane Austen's "Persuasion", Suzanne Collins' "The Hunger Ga Elizabeth D. Marie enjoys writing stories that integrate faith, history, adventure, romance, and the real-life struggles of the human condition. She published her first book “Awaiting the Dawn” of the Web of Time series when she was nineteen and has been actively writing/publishing ever since. When she can't find a book to satisfy her imagination, she writes one. Her current writing obsession is her "Crown of Stars" fairy-tale retellings series, while enjoying life in her little square of wooded country, and playing fetch with her Bengal-mix cat "Captain Cal."